Installing a Whole House Water Filtration System is an Important task! Based on your decision to filter you water I am sure you have done research about the contaminants found in California tap water. If you are ready to install a whole home treatment or purification system you have found a system that works for your specific needs and treatment specifications. If this is the case, please consult with the system manufacturer to make sure you system does not require special instructions. Installation of a whole house water filtration system should be taken care of by a license plumber or someone with plumbing experience. 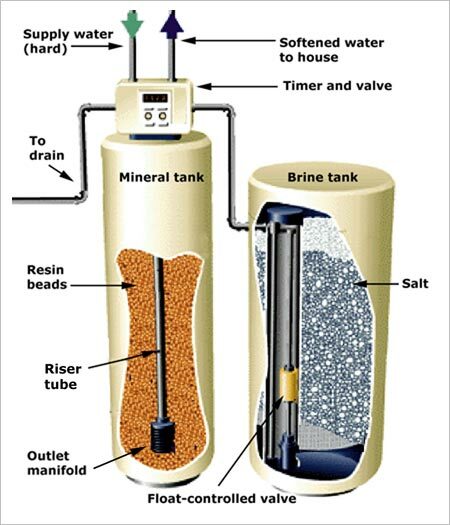 Since you are installing a filter for the whole house it is imperative that all water entering the home be filtered thus installing the system where the water enters the home is ideal. 2. Clean the space you plan to place the water softener. 3. 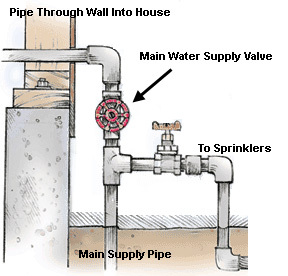 Be sure to turn off the water to the house and DO NOT disrupt the water flow in front of the shut off valve. This can lead to a lot of problems if the line breaks and water is gushing out with no shut off valve. 4. Measure and cut the lines in preparation to install your water softener. By taking a look at the next image I would like you to take not of 3 lines and their functions. Supply water is the water coming into the house from the street or well pump. This is the bad water that we wish to filter. Next I would like you to notice the Softened water to the house because this is the water that is already filtered and will now proceed into your home. The last thing I would like you to notice is the To drain water line. This line is usually connected to a septic line or an outside drain. This is where the bad water is filtered to after the brine tank cleans itself. We have compiled a list of water filtration systems and the directions you would need to install one yourself. If you are a contractor that installs whole house water filtration systems we would love you input. Send us an email at Support@wholehousewaterfiltrationsystem.com and we can make you a moderator. If you are just looking for whole house water filtration system installation guides you found the fight place! Pick the system you would like to install or pair the system with a local water filtration system installer in California. Use our coupon save10 and get 10% off installation immediately.